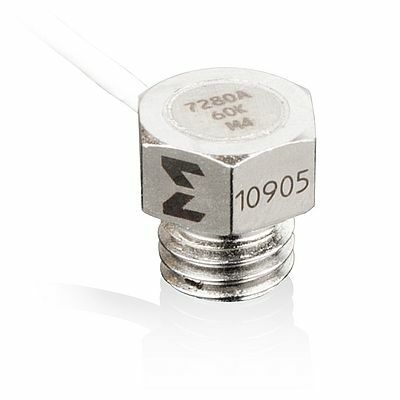 Offered in 20,000 and 60,000 g ranges, Endevco model 7280 series lightly damped single axis high-g piezoresistive shock accelerometers offer survivability to four times over-range, minimum shift after shock, higher impedance and lower power consumption than legacy models. They incorporate the use of Meggitt Sensing Systems’ new lightly damped MEMS sensing element, expressly designed for lower power consumption. Input voltage can be customer-specified, with 10V offered as standard. The series model 7280A incorporates the sensing element within an industry standard screw mount package, while the model 7280AM4 is offered within an industry standard stud mount package. Occupying the same footprint as the 7270A series, the 7280A is further designed to serve as a drop-in replacement for applications in which a legacy sensor may be in use, but where survivability may be prioritized over higher bandwidth, as well as where the use of a sensor with light damping may offer certain testing advantages. Designed to support pyroshock, weapons testing, high-shock data recorders, missiles, munitions and other demanding requirements, the rugged sensors’ global sales is subject to ITAR.